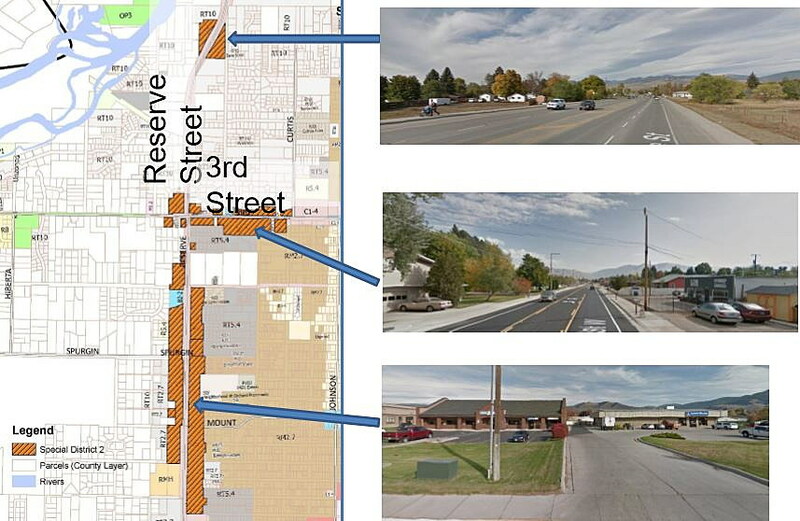 Members of the Missoula City Council on Wednesday took the first step in approving defunct zoning rules for a run of properties along Reserve Street, saying the changes will create standard zoning that gels with the city’s new design overlay. If approved by the full council on Monday, the changes will increase residential density from 16 dwelling units per acre to 43, and reduce the setback from 100 feet to roughly 45 feet. “We’re proposing this change to create standard-based zoning districts that will work with the design excellence overlay, and replace an ordinance that’s outdated, onerous and refers to the old zoning code, which has gone out of effect and doesn’t reflect the current character of the neighborhood,” said Tom Zavitz, a senior planner with the city. In 1982, when the old zoning district was established, the area was considered light residential, and Reserve Street was little more than a rural, two-lane highway. Over the past 35 years, however, Reserve Street has blossomed into a five-lane highway carrying heavy traffic, and development has shifted from residential to commercial. The zoning changes, approved by the Land Use and Planning Committee on Wednesday, looks to invite new uses to the area, including residential and mixed use. To do that, it increases the residential density from 16 units per acre to 43, and it reduces the setback from 100 feet to 45 feet. The Montana Department of Transportation maintains a 30-foot right-of-way, so the setback proposed by the city is less than it sounds. Efforts to make better use of land, increase density and reduce setbacks have drawn some criticism, Zavitz said. While most property owners in the area have approved of the plan, roughly 15 written comments have opposed it. Some cite concerns over increased traffic on Reserve Street, though Zavitz said that’s an issue that goes beyond zoning. While MDT maintains a 30-foot right-of-way along Reserve, there aren’t any plans currently to widen the highway and add additional lanes. Zavitz said the state agency is willing to work with the city on future remedies, though it has been reluctant to weigh in on the city’s zoning changes. “They have said they’d like to work with Missoula on the traffic problem on Reserve Street in the future, but in this case, they want to continue to review any of the larger projects, one by one as they come in. Members of the council expressed support for the new zoning plan, especially as it pertains to land use and safety at CS Porter Middle School.